As with the other parts of the review, apologies to any bands I omit from the review. Sunday at Bloodstock started for me with Kobra and the Lotus performing on the main stage. This is a band who have been working hard over the last few years playing gigs around the country as well as in their native Canada, and have played smaller festivals before, but with the release of their new album they've exploded this summer playing pretty much all the major festivals around Europe including Download, Graspop, Wacken and many more, and now its the turn of Bloodstock. Frontwoman Kobra Paige has a superb voice, and really shows its power as she belts out the songs. The rest of the band are also in top form and are showing their festival experience as they make the most of the large stage and the large crowd in front of them. New tracks including "Welcome to my funeral" go down very well. An excellent start to the final day of the festival. Over on the New Blood stage, From Ruin were putting in a very impressive performance. I'd seen their acoustic set earlier in the weekend and been impressed enough to come and see their main set. Todays performance was even better than the acoustic set - definitely a band I'd like to see again. A thousand enemies, on the acoustic stage were very good - I'd heard from friends that they're worth seeing, and after their short acoustic set I have to agree - a band I'll try and see again. On the main stage Corrosion of conformity, Nile and Black Dahlia murder all put in good sets and drew good crowds. Back on the Jaegermeister acoustic stage, Splintered Soul were making their second appearance at the festival after their Sophie Lancaster stage performance earlier in the weekend. Violinist Sally Jo was this time playing a conventional violin rather than the more space age one she usually plays with Splintered Soul. The band put in another great performance. The acoustic sets in general, do sound very different to the normal electric sets bands are used to, but when the songs are good and the performers are talented then they can both be excellent. Splintered Soul certainly did well at both. Later on the Jaegermeister acoustic stage we had Orianthi. Known to many as one of Alice Cooper's guitarists, she has an impressive reputation having been Michael Jackson's guitarist for the tour that never happened due to his death, and having played with the likes of Carlos Santana and Steve Vai. She's also had a number of solo releases, and todays set was based on her solo material. I'd seen her before with Alice Cooper, but watching her play today was stunningly good - her guitar work is simply amazing, and she's got a damn good voice too. A very impressive performance that I'm sure will have led to plenty of people heading to Amazon etc to buy her CDs. Back on the main stage, Anvil were doing what they've been doing for decades - good heavy metal. Note thats good but not great - frankly if they hadn't had a movie made about them, they wouldnt be here and would have remained relatively unknown. Paradise Lost were far better than when I saw them last, but they did seem uncomfortable on the main stage in daylight - a darkened venue would seem to be their natural home. Their lack of stage presence didnt help them win many new fans despite the strength of their material. Back on the Jaegermeister acoustic stage, Kobra and the Lotus were next up with a set of cover versions - all Ronnie James Dio songs. Dio had such a great voice that covering his songs and doing them well is a challenge to any vocalist, but one that Kobra Paige handled with ease. They put in a great performance which included one of the highlights of the weekend for me. As they started to play "Holy Diver" the crowd started to sing along without being prompted, and so we got several hundred fans singing along and even drowning out Kobras powerful vocals - a magical moment. Dimmu Borgir were next on the main stage, and put in an excellent performance. Having missed their UK tour last year thanks to the London date selling out so quickly I was definitely looking forward to seeing them. Sadly we didnt get the full orchestra and choir that played with them at Wacken, but we did get a really impressive performance. 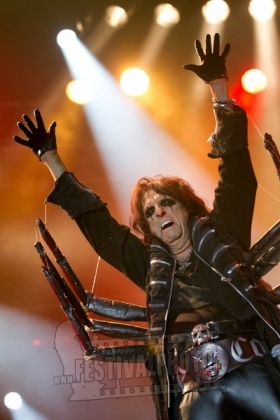 After Dimmu Borgir it was time for the closing act of the festival, the legendary Alice Cooper. Right from the start where he appeared at the top of a staircase with sparks coming from his hands, he made it clear that as always he was there to put on a show not just to sing a few songs. Alice Cooper shows are always very theatrical and usually involve him dying at least once (tonight it was the guillotine chopping his head off). With a great band alongside him (including Orianthi on guitar), he blasted through a set of classic songs including I'm eighteen, Schools out, Poison, The black widow, I love the dead, no more mr nice guy, Billion dollar babies, under my wheels, and Elected. What a great way to end the weekend. For me the New Blood Stage has to be one of the best bits of this years festival - there was an amazing selection of really impressive bands there over the weekend and the standards were extremely high, showing that there are lots of small bands in the UK with a lot of potential. Well done to Simon Hall and the rest of the Bloodstock team for searching out the great bands that were picked to play. Security. The Showsec guys in the photo pits and around the site were always cheerful and friendly as well as professional and hard working. They handled crowd surfers well, but most important they made an effort to create a good atmosphere - I even saw one member of security working his way along the pit at main stage giving everyone at the barrier a hug. A great layout - the site is small enough to be easy to get around but without feeling cramped. The serpents lair (the VIP area). A great bar with a superb selection of real ales and proper ciders, DJs playing late into the night, and a great friendly atmosphere. The whole atmosphere at the festival was superb - it's a really friendly festival and there are lots of people there with small children, testament to the good atmosphere and friendly nature of the festival. Criticisms? Very few actually. Chief among them was the shambles that was parking for VIP campers. The VIP camping area has been significantly expanded this year, but the parking area wasn't so large numbers of VIP campers had to park in the main car park and endure a long walk, or as one friend on crutches found, they could wait for the shuttle bus (they waited for over an hour). Given that the ability to park near the tents is a kep selling point of VIP camping this wasnt good enough. Shower facilities were also in need of being increased in VIP camping. The serpents lair toilet facilities werent enough meaning there were queues for both male and female toilets almost constantly throughout the day. On the plus side, the toilets in the main arena were clean and there were plenty of them. The replacement of Monster Energy with Red Bull wasnt a popular choice - last year there was free monster energy for people in the serpents lair but this year not a thing. In Summary - a great weekend at one of the best festivals around. I'm already looking forward to next year (so far only Anthrax have been announced for next years lineup).